In today’s episode, Richard A. MacKinnon explains the concept of psychological flexibility and how we can change our behaviour to be values-led rather than emotion-led. 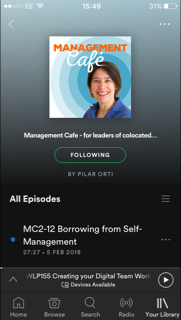 If you enjoy this episode, check out the ten episodes of the Management Café podcast and Evidence Talks. Psychological Flexibility – it can be developed. The fact that professionals are being trained in this skill shows that we are acknowledging the wholeness of people coming to work. Emotions! Values! Can we talk about these at work? So, what is psychological flexibility? A set of skills that support each other (thinking and behavioural skills) that allow you to step aside from troubling thoughts and emotions and not let them take over the situation. Values-led action rather than emotions-led action. Are emotions heightened when we go remote? Letting our values guide us. Checking assumptions before we let our emotions guide us. Behaving in alignment with our values. We’re not talking about not having emotions. “Defusing” thoughts and emotions to identify the thoughts. The concept of “rigid self” – here comes the “flexibility” in psychological flexibility. When working at home, we run the risk of disconnecting from our values as well as from our organisation. What else does WorkLifePsych do? Check out episode 81, also with Richard, this time talking about his work at the Future Work Centre. Don't miss out on future episodes: sign up to our monthly newsletter for article, books and podcast recommendations. Newer PostWLP142 - Why Are We Rushing to be Productive? Older PostWLP140 - Sensors in the office, LinkedIn Data and more!